Julie Van Camp teaching dance criticism and aesthetics to Colorado Ballet Academy students. Photo Courtesy Colorado Ballet. When choosing a pre-professional program, many dancers focus on the number of hours they'll spend training in the studio. But technique is only one ingredient in the recipe for making a professional dancer. To produce well-rounded artists, many ballet schools are expanding their curriculums to include classes in dance history, science, stagecraft and career counseling. “The focus so much now is on technique, but I think it's important for us to go back and develop ourselves as artists and people," says Colorado Ballet Academy director Valerie Madonia. The broader knowledge these supplemental classes bring makes dancers more marketable as professionals, and helps distinguish a good dancer from a great artist. Kirov Academy of Ballet students in stagecraft class. Photo Courtesy Kirov Academy. Kirov Academy students in dance history class. Photo Courtesy Kirov Academy. Your level placement determines much of the training you’ll receive at your summer intensive: the teachers you’ll have, the variations you’ll learn and the choreography you’ll perform at the closing performance. What should you do if you’re placed lower than you deserve? As nerve-wracking as it may be, you need to talk to your teacher if you are concerned that it will hold you back. Are You Really in the Wrong Level? It’s best to take a few classes before speaking up to make sure your emotions aren’t getting in the way, as being placed in a lower level can be hard on the ego. Look around you—are the dancers you’re with truly below your technical level? If so, did you have a horrible placement class? Are you overcoming an injury? Houston Ballet Academy director Shelly Power says level placement isn’t about your worth as a dancer, but how you match up to that year’s applicant pool. “Remember that the auditioner goes out and sees what the level is across the country,” she says. “It goes through trends.” The talent pool and number of dancers that audition for a program vary each year. If you’ve given your level placement some thought and still feel it’s incorrect, you should ask to talk with your main teacher within the first week of the program. Power stresses that having an accusing tone—telling the teacher that she put you in the wrong level—will not help. Instead, approach the conversation with an eagerness to improve. I’m surprised that I have been placed in this level. What should I focus on this summer to progress? You may discover that something very specific is holding you back. For instance, “At The School of Washington Ballet we look at pointework very closely,” says school director Kee Juan Han. “To me, pointework is very delicate and it needs to be very carefully formed.” If a dancer needs to improve her pointework, Han might place her in a lower level so she can build strength and avoid injury. Even if the conversation doesn’t result in being moved up, letting a teacher know you’re worried about your improvement during the program can only benefit you. “It doesn’t guarantee that you’re going to be moved up,” says Power, “but it does give you a little bit more focus from the teacher.” Cluing them in to how you feel lets them know that you’re ready for a challenge—they might be a little harder on you, give you more corrections or push your technique. If your level doesn’t change, don’t let it affect your experience. “Standing out like a sore thumb because you’re depressed or mad won’t help show that you have the maturity to handle the stress of being in a higher level,” says Power. The education you gain at a summer intensive is more than technique alone: It tests the maturity, independence and tenacity that are required to be a professionaldancer. “When you’re in a company and a choreographer sets a piece, you’re going to have days with many of the same feelings you have now,” says Power. Enjoy the perks of being at the top of your class. “If it were me, I would rather be in the top tier than go to another level where I’m struggling to keep up,” says Han. You might get more attention from teachers and a chance for bigger roles in the end-of-program performance, leading to more coaching time and attention from the affiliated company’s artistic staff. And if the dancing doesn’t feel vigorous enough, push yourself to work on the details of your technique and ask your teacher if you can take extra classes with other levels. There are several technical hurdles that many dancers struggle to overcome, like raised shoulders and floppy wrists. Though they may seem like small details, they can stand between you and your next level—whether that's entry to a prestigious summer intensive, a top score at a competition or even an apprentice position at a coveted company. These bad habits aren't easy to break; even professionals battle them. Sarah Van Patten, for one, admits that her shoulders sneak up when she's tired, preventing her from fully engaging her back. 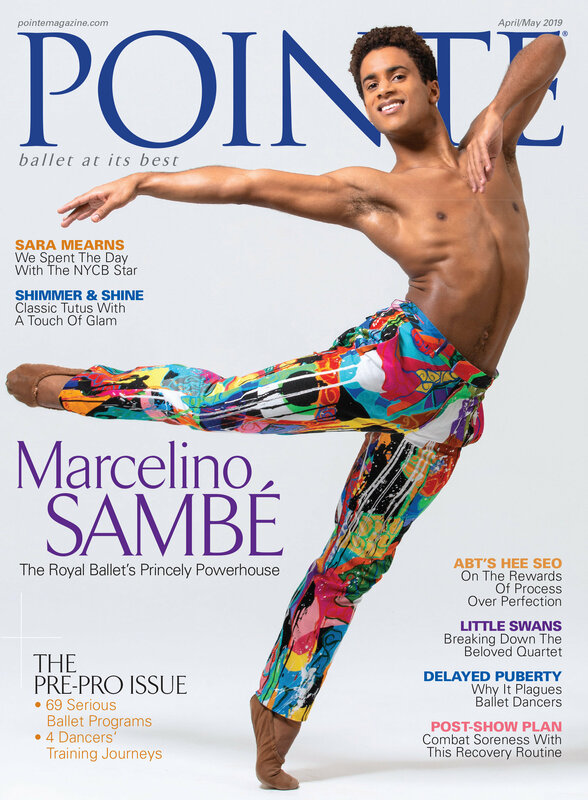 “I lose that connection and I'm not on top of the movement," says the San Francisco Ballet principal. “It's a habit I have to constantly think about." Boston Ballet School director Margaret Tracey finds that no matter how often teachers or coaches point out certain issues, dancers frequently have trouble applying the advice. “I can give the same correction over and over again," she says. “But it's up to the dancer to make the adjustment." Sometimes, it takes a new approach to do the trick. Most of us strive to perfect our performances, but do you ever wonder what it feels like on the other side of the rehearsal studio? Many top training programs, including the School of American Ballet, Boston Ballet School and the Chautauqua Institution, have started offering choreography workshops, classes or intensives. While these are typically optional, there are plenty of reasons why you should opt in—regardless of whether you plan on becoming the next Balanchine. With more of today’s ballet companies emphasizing new choreography, either through commissioned works (sometimes from their own dancers) or even choreographic competitions, your chances of being created on are quite high. By stepping into a choreographer’s shoes, you can grow more keenly aware of what they need from you as a dancer, making you a more attractive hire. This year, Hineline plans to build upon the FirstSteps program by offering composition classes to help dancers better understand choreographic building blocks, such as musical phrasing and spatial structure. His class will introduce students to formal structures shared between different forms of art, such as one group working against another in a canon. “You watch something like Balanchine’s ‘Waltz of the Flowers’ and you see how canons are so effective as a means to express musicality,” says Hineline. Most schools use a hands-off approach to choreography, allowing students to create whatever they like and cultivate a personal working style. “Some dancers come in and have all the steps mapped out,” says Hineline, “while others are freer in their process.” Either way, students learn that flexibility is key, as ideas often change. For instance, Alexander Manning, a CPYB alum now apprenticing with Miami City Ballet, discovered that phrases that felt comfortable on his male frame sometimes looked laborious on his all-female cast. Showing your piece and listening to feedback is common during choreographic workshops. “It’s very exposing,” says Cobb, “but it allows the choreographers to step back a bit and see their work for its full value.” For instance, after faculty members advised Potter to create more emotional connections between his dancers, he spent the remaining rehearsal period developing their characterizations. Learning to take critiques about something you’ve created can be one of the most challenging parts of the process, but it builds maturity that can translate back to your dance life. Solo dancers will present two works each. Choreographers will be allowed to enter solo, duet or group works. All interested competitors can apply online at vkibc.org. Want to take class while you’re on tour or vacation? Download the On Point Dance app for your iPhone, iPad or iPod touch. You can search 16 major cities to see a list of daily class schedules at all nearby dance schools. Quickly scroll from school to school and compile your own list of the best offerings. The program costs 99 cents in iTunes. For serious ballet students who don’t plan to major in dance in college, performing with a student-run ballet company is becoming an increasingly accessible option. More and more schools offer them. And the troupes can be incubators for real talent—alumni of Harvard Ballet Company, for example, now dance with American Ballet Theatre, Los Angeles Ballet and Ballet Austin. Student-run troupes aren’t about polishing your dancing—the training will never be as rigorous as a dance department’s. Yet the do-it-yourself spirit can lead to artistic growth like Silvern’s, or new behind-the-scenes interests. A student company can also provide possibilities to take on leadership roles by choreographing, teaching or directing. However, the opportunities vary widely from school to school. Figuring out what you’ll gain from the experience requires a little investigating. The first indicator of a company’s level of professionalism? Auditions. Some companies require dancers to try out at the start of every semester or school year, and take only students who dance at an intermediate or advanced level. Others allow anyone to show up to their open class, which probably won’t be as intense. Also look at how many hours of class and rehearsal will be required. You’ll typically find one weekly 90-minute class, taught by company members or the occasional guest artist, plus rehearsals. Stanford University’s Cardinal Ballet Company, for example, holds a four-hour rehearsal each Sunday (one hour per piece). However, the company doesn’t give any company class, so most members rely on the Monday, Wednesday, Friday advanced ballet classes in Stanford’s dance division. Serious dancers at any student company almost always have to take outside classes through their school or a local studio to keep up their technique. Most companies offer two or more performances a year, with a varied repertoire that typically includes at least one classical variation from a ballet such as Paquita or Swan Lake. Often, interested dancers also have the opportunity to choreograph on their peers. Many troupes bring in guest artists to set work as well. Cardinal Ballet Company recently performed a piece by Amy Seiwert. Columbia Ballet Collaborative, which reaps the benefits of its New York location, works regularly with Emery LeCrone and other New York–based artists. “Choreographers love working with our company because we provide studio space and high-caliber dancers, and they get the opportunity to spend a whole semester working on a new piece,” says Silvern. Dancers from New York City Ballet occasionally perform with Columbia Ballet Collaborative as well. At some troupes, such as Harvard Ballet Company, directors take dancers’ preferences into account while casting “We try to foster a collaborative, egalitarian environment,” says member Bridget Scanlon. Others, such as Columbia Ballet Collaborative, reflect the professional world by allowing choreographers to cast their own pieces. Though some alumni go on to performing careers, a major benefit of student companies is the exposure to other aspects of the field. Dancers frequently end up working offstage in production, administration and development roles. Recent Stanford graduate Colette Posse notes that classmates who were in Cardinal Ballet Company now work in the administration of companies such as Alonzo King LINES Ballet, and have even founded their own contemporary ballet troupes. Classical ballet has a strong following in Cape Town, South Africa. The Cape Town International Ballet Competition, founded in 2008 by Dirk Badenhorst of the South African Manzi Ballet, attracts talent from all corners of the globe—and a number of young North Americans have already made their mark there. Patricia Zhou remembers hearing her coach’s encouraging voice in her head as she competed at the Beijing International Ballet Invitational in 2010. Now in the corps of Staatsballett Berlin, Zhou says the days Viktor Kabaniaev spent coaching her ranked among the most productive of her training. “He made me practice my entrelacé diagonal over and over to get me to jump more and really kick the front leg. Even when I was tired!” she says. “That made me so much stronger.” Most importantly, Kabaniaev gave Zhou confidence. “I’d never gone to competitions thinking I had to win. But he pushed me, and had me believing in myself—and believing I could place.” Their work together paid off: Zhou left Beijing with a silver medal. It takes more than dazzling technique to succeed at top competitions. You also need a superb coach. “Your coach is there to be your eyes, your cheerleader and your guide,” says Evelyn Hart, who coaches dancers in Toronto. The best coaches will help you improve your weak spots—and polish aspects of your dancing you didn’t even realize needed work. But finding the right match takes some searching. Good coaches will fine-tune everything: the technical, the artistic and the stylistic details. “Avoid anyone who just runs the variation repeatedly without digging deeper,” says Edward Ellison, a New York teacher who has successfully coached dancers. “Each section of choreography should be carefully dissected, exploring how each individual part of the anatomy contributes to the whole.” Contact dancers who worked with the coach in the past to ask how supportive they felt the coach was, if he or she helped find solutions to the dancer’s problems, and assisted with practical details like costumes, makeup, hairstyle and music. But to find a good coach for you, take stock of your personal weaknesses. Do you need to refine your interpretation or work on your upper body? Find someone whose dancers show those strengths. Check out online videos of a coach’s past competition winners to see if their style resonates with you. Look at their repertoire, how they accent the movement, and their costume choices. Lastly, look for a coach who’s been through the competition you’re going to. You want an insider in your corner: someone who will know the level of talent, and understand the psychological pressure. “A coach who’s been before will know the politics of a competition,” Hart says. “It’s stressful: There might be very limited space and time, you might have to rehearse on stage at 3 a.m.—how do you handle that?” A good coach will guide you through it. Former Miami City Ballet artistic director Edward Villella (who was recently given the American Academy of Arts and Letters’ Award for Distinguished Service in the Arts) will lead the USA International Ballet Competition jury in 2014. He’s taking over from Bruce Marks, who led for two decades. As the American sister of the prestigious IBCs in Varna and Moscow, the Jackson competition is one of the oldest and most respected in the country. Top companies attend to scout dancers, and a USA IBC credit on a resumé is an impressive mark of distinction. ?Organizers are currently accepting applications. Awards: Gold, silver and bronze medals, cash prizes up to $15,000 and scholarships. Companies in attendance often offer one-season contracts and apprenticeships. Feedback: Although jury scores are not released, eliminated competitors are offered a private evaluation session to review the judges’ written comments and suggestions.